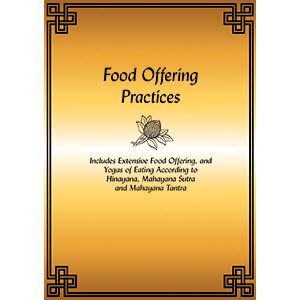 A collection of different food offering practices to use in daily life including: extensive food offering practice, general food offering prayers, and the yogas of eating food according to Hinayana (and for Sangha), Mahayana Sutra and Mahayana Tantra. 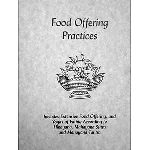 There are a variety of virtuous ways to enjoy your next meal! Staple binding. 36 pages, 2011 edition.